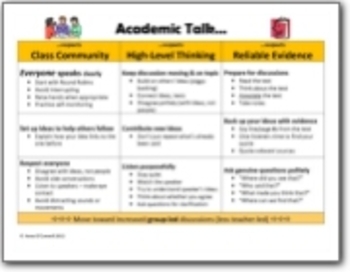 This chart lists norms for academic class discussions that help students ensure that the conversation is respectful, on-topic, and based on textual or other evidence. It's a great tool for helping students with CCSS Speaking and Listening Standards. I created this chart for grades 9-10, but it could easily be used for any middle or high school classes. Note: this will be most useful for discussions based on texts in subjects in the humanities.